FairSquare is the UK’s first fully independent platform for buying and financing new or used cars– with incredible discounts already negotiated on your behalf. By buying your financed car at FairSquare you can reap all the benefits from a one-stop-website that takes care of initial search, transaction completion and even home delivery. 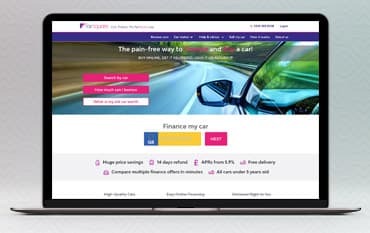 FairSquare has developed a unique zero-impact soft search process for checking creditworthiness from one of the industry’s broadest panels of lenders, they also deal with multiple dealer groups from across the UK and are consistent in sourcing all of their vehicles through these dedicated dealers, ensuring bulk-buying discounts for customers. Browse for your ideal car by price or make and discover all kinds of affordable models from names like Alfa Romeo, Audi, BMW, Citroen, Fiat, Ford, Honda, Hyundai, Jaguar, Jeep, Kia, Land Rover, Lexus, Mercedes Benz, Mini, Mitsubishi, Nissan, Peugeot, Porsche, Renault, Toyota, Volkswagen and many more. Browse for your used car by finance option, age, make, model, model variant, body style, fuel capacity, transmission, number of doors, colour, age and mileage. You can even filter the monthly payments, initial deposit and credit term to suit your requirements and budget. Once you find your ideal car you will be presented with a quote that’s based on a ‘Representative APR of 5.9%’ for an 'excellent' rating for Hire Purchase (HP) finance. Monthly payments that may be presented are also indicative and will also vary depending on credit amount and the quality of your credit score. You will receive accurate monthly payments and quotations once you reach the ‘Example Lender Quote’ and ‘Confirmed Offer’ stage. Not only does FairSquare provide new and used cars they also allow you to sell your car via their partner website: webuycarstoday.co.uk. Simply enter your registration number into the search bar available and receive a quote for how much your current car is worth. By using this precise, accurate and unbiased car valuation system you can easily find an accurate value of your car for free without even leaving the house. If you are happy with the quote you receive you can then arrange payment and free collection from anywhere, and if you sell your vehicle on the same day as you list it, you won’t have to pay any transaction fees. FairSquare has one of the industry’s broadest panels of lenders, so even if your credit score is poor, they may be able to match you and your unique circumstances to the most suitable lender. However, they cannot guarantee approval for everyone. Do I have to put down a deposit? Yes, there is a £200 deposit required. However, most lenders will require a larger deposit than this for you to secure finance offers. How can I contact Fair Square? FairSquare is the pain-free way to finance and buy a car. Simply buy online and get your brand new car delivered for free. Compare multiple finance offers in minutes and choose from an impressive selection of new and used cars, all of which are under 5 years old. FairSquare have thousands of new and used cars to discover and they’re completely independent, which means they’re always able to find you the very best deals, with many of their cars available with great discounts already applied. And, if you add a discount code from us to your order you can save even more on your car and it’s finance.